I started describing our pilgrimage from this summer - what we did each day from when we left on June 12 until our return on August 3. Unfortunately, memory follows its own chronology and the following event is out of sequence. 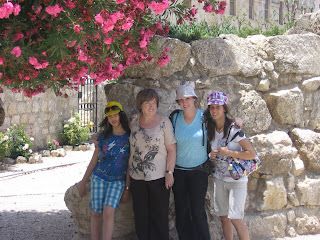 But of our time in Israel, the memory of one moment is so strong, I need to write about it. In fact, it speaks to a certain aspect of prayer that is often overlooked. Prayer is sometimes greatly helped by symbols - not just signs seen, but also holy things heard and felt, sacred symbols like the music of church bells. Obviously, a symbol points to something beyond itself, indicating a reality greater than it can contain. A cross symbolizes Christ's work of redemption and the conquest of good over evil. And although symbols are generally thought of in terms of things we see, when it comes to prayer, all creation takes on symbolic proportions, including sound and especially music. So I plead your patience while I tell you about the bells of Mt. 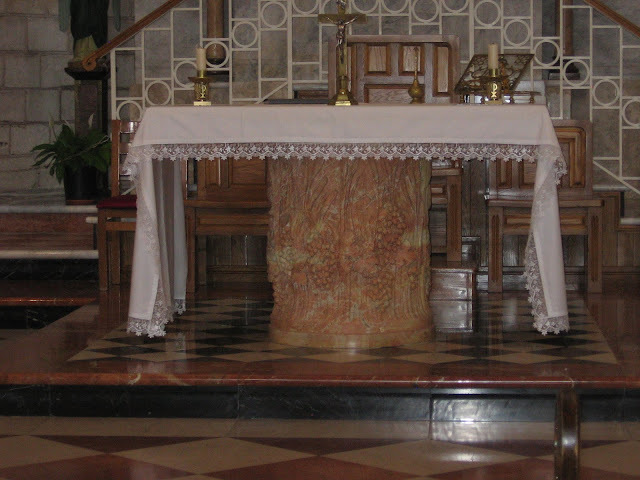 Tabor, which we did not hear on the second day of our pilgrimage but rather on the third. Mt. Tabor is the place where the transfiguration of Christ Jesus is traditionally believed to have happened. The very large hill overlooks the Valley of Megiddo, a place of biblical, historical and eschatological battles. 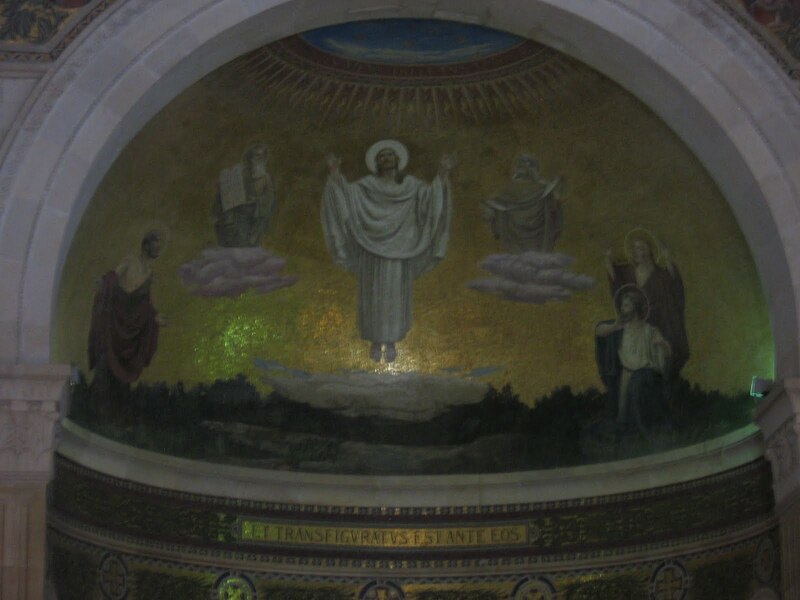 Jesus ascended this mount with Peter, James and John. As he did this, light and darkness covered the mountain just as happened to both Elijah and Moses in their encounters with God. What is more, Elijah and Moses appeared with Jesus and they spoke together. Peter asked Jesus whether he could build three booths - perhaps a reference to the Feast of Tabernacles - the September feast by which Israel remembers that God had us live in tents when he brought us out of the Land of Egypt, the feast on which Solomon dedicated the Temple - God's dwelling place, the feast on which pilgrims would journey to the Temple to hear the law, the feast which according to Zechariah the Messiah would make universal for all peoples - the judgment day. Jesus does not respond to Peter's request. There was no need to build another earthly tent. Jesus himself is a new dwelling for God and Man. The messianic meaning of tents in the wilderness and the Temple of Solomon were fulfilled in Him. The whole theophany revealed a great Christian truth about prayer: it is to Christ Jesus we go to know the will of God. The voice of God came out of the bright cloud surrounding Christ and said, "This is my beloved Son. Listen to Him." 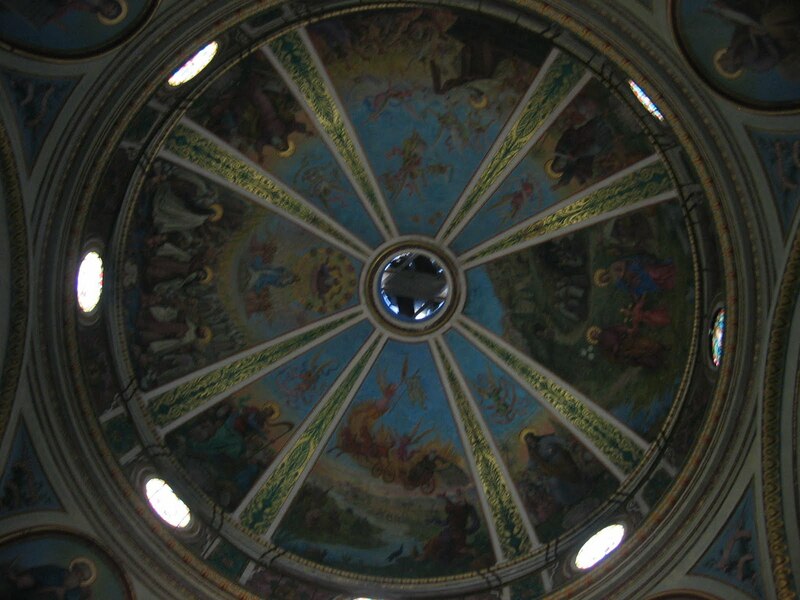 The Church of the Transfiguration is beautiful and so are the views from atop Mt. Tabor. Yet comes to my memory most vividly was not what I saw but what I heard: the explosion bells just as we began to descend the front of the church. The deep beautiful tones pealing over head physically resonated deep in the heart. Everyone stopped and let the tolling role right through them. It was an incredible moment of prayer. It was the Angelus. Each resounding toll was a symbol of the voice of God, that voice echoing out to Peter, James and John - His voice that takes away fear and leaves one's heart in peaceful silence and adoration. "News from afar, news of the infinitely limitless God, news of man's bottomless desire, and of its inexhaustible fulfillment. The bells are a summons to those "men of desire" whose hearts are open to far-off things. The sound of bells stirs in us the felling of distance. when they clang out from a steeple rising above a wide plain and their sound is carried to every point of the compass, and on and on to the hazy blue horizon, our wishes follow them as long as they are audible, until it comes home t us that there is no satisfaction of desire in far distant hopes, or indeed in anything outside ourselves. Or, when the pealing bells of a mountain-built church flood the valley with their clamor or send the sound straight up to the zenith, the listener, straining to follow, feels his heart expand beyond its usual narrow limits. Or again, the bell tones in some green glimmering forest may reach us faintly, as from a great distance, too far off to tell from where, and old memories stir, and we strive to catch the sounds and to remember what it is they remind us of. At such moments we have a perception of the meaning of space. We feel the pull of the height, and stretch our wings and try to respond to infinitude. 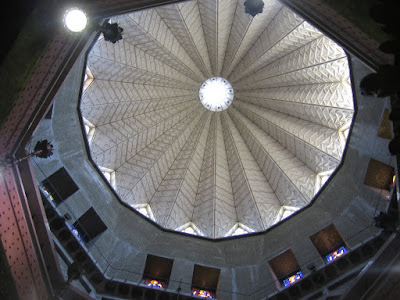 The bells remind us of the world's immensity and man's still more immeasurable desires m and that only in the infinite God we can find our peace. O Lord, this my soul is wider than the world, its longing from depths deeper than any valley, the pain of desire is more troubling than the faint lost of bell notes. Only thyself canst fill so vast an emptiness." The Pilgrimage Continued... still on the first day! 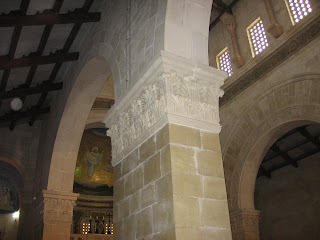 Up to the last post, I was sharing about our pilgrimage to the Holy Land. 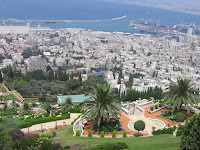 The first day we set off to Caesarea then Haifa where Mt. Carmel is, then Cana and finally Nazareth. It was a true whirlwind and when we finally got to our hotel in Tiberius, everyone was exhausted. Everyone agreed that it was almost too much to take in: the history, the beauty, the culture, and the deep spiritual meaning of each place. We were submerged in the Scriptures - like a living Gospel, the Holy Land was its own witness to the presence of God in human history and in each of our hearts. Part of the spirituality of a pilgrimage is learning to be patient with different kinds of hardships. This particular hardship was disguised. We were catered to all day, went to some wonderful places of prayer (I will get back to those in the next post), learned a lot from our Arab-Israeli guide - Sami, and ate well. Before we left, I had explained to everyone that going on a pilgrimage requires a lot of patience. Now everyone teased me because they felt more spoiled than anything else - they had all expected more spectacular hardships. At the same time, there was a little sensory overload and, whenever anyone goes into an unfamiliar culture, there are a host of small inconveniences that, even if unnoticed, are a little draining. So the fatigue was to be expected, and having a little quiet time and personal space welcomed. No one really complained. There were fourteen of us - mostly friends and family, and some who became friends as we journeyed on our way. That night, we got together on a terrace overlooking the Sea of Galilee and recounted our favorite adventures. The experiences were as diverse as the number of pilgrims - so that even if a few mentioned the same place (like the Orthodox Church of Mary's Well), they recalled it for different reasons. Different kinds of moments of prayer touched us all in different ways - and somethings that did not mean much to one pilgrim were very meaningful to another. Sharing these helped us all pick up on details we missed and more deeply appreciate the gift God was giving us. 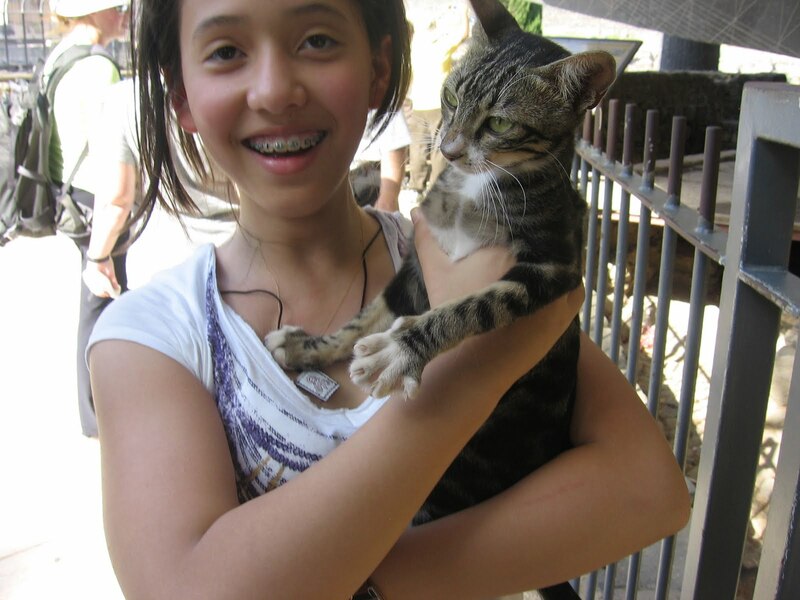 There were also experiences that could not quite be articulated, but that we shared in common nonetheless. There is an analogy here with praying over the Scriptures. A whole group of people can have the same Biblical passage read and explained to them, but still have their own experience of what God is speaking to them through the Bible. That is because the Word of God is inexhaustible: both communal-ecclesial and personal - that is it is addressed to the whole Church and at the same time to each of us in ever new ways. 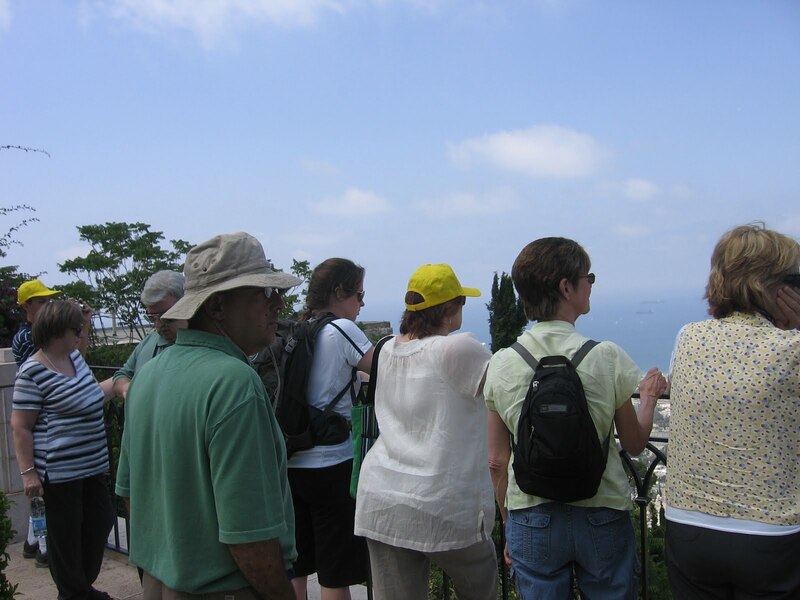 One of the great blessings of going on a pilgrimage with a group is that we experience this same ecclesial and personal grace through the sacred geography disclosed in Scripture and Tradition. Such graces have the character of a little exchange of love between God and us, and with one another. In my last post I shared a little bit about Mt. Carmel in Israel and how it became the birthplace for a new religious order in the Church, the Carmelites. This community continues to attract young people who yearn to commit themselves completely to the Lord. While all of us must seek to renew our devotion to the Lord every day so that He is first in our lives, there are some who have dedicated themselves to the Lord in a special way, and they join communities like the Carmelites. Carmelites, like other religious communities bind themselves to Jesus by renouncing all earthly goods, even marriage, for his sake. In the tradition of the Church, when a woman does this through religious consecration, she makes of herself, in a certain sense, a Bride of Christ - a living icon of the Church. Although there are many generous young people who make this kind of offering of their lives to the Lord, one woman who did this in the late 19th Century was Elisabeth of the Trinity as a Carmelite nun. In her own reflection about the kind of commitment she aspired to, she reveals an attitude of heart we should all have. I have recently translated a personal note she wrote for herself known as PN 13, "To Be a Bride of Christ:"
Not merely an expression of the sweetest of dreams, this is a divine reality. This above everything else expresses a mystery of likeness and union. On the morning of our consecration, the Church gives us this name: Come, Bride of Christ! This life must be lived as Bride: "Bride" fully presents love given and received - an intimate, faithful, absolutely devoted love! ...To be bride, this is to be surrendered as He is surrenderred; to be immolated as is He, through Him and for his sake. This is Christ making himself completely ours, we becoming entirely his own. To be Bride is to have every right over his heart... This is a life long heart to heart... living with... always with ... to rest entirely in Him, and to permit Him to rest entirely in our soul! To be Bride means knowing more and more how to love: to love in adoration, to love in reparation, to love in prayer, to love in asking, in forgetting oneself; to love always in everything! To be Bride means keeping one's eyes in His eyes, Him haunting every thought, one's heart completely captured and entirely enveloped by Him. To be Bride is to be totally outside oneself and passed into Him. The soul is filled with his soul and with his prayer, wholly captivated and given to him. This means, while always fixating one's gaze on Him, to notice the least sign and the least desire. It means entering into all his joys and sharing in all his sorrows. It means being fruitful, a co-redeemer, bringing souls to birth in grace, multiplying the adopted children of the Father, the redeemed of Christ, the co-heirs of his glory. To be Bride, a Bride of Carmel, is to have the burning heart of Elijah, the transpierced heart of Teresa of Avila, his true Bride because of her zeal for his honor. Finally, to be taken as His Bride, His mystical Bride, is to have ravished His Heart to the point of forgetting all distance, the Word overflows in the soul with the same infinite ecstacy of love which He has within the Father. Here, the Father, the Son and the Holy Spirit invade the soul, deifying it, and consuming it in the One by love. This is marriage, a fixed state, because this is an indissoluble union of wills and of hearts. And God said: Let us make for Him a companion like Himself, the two shall be made one. Our pilgrimage continued from Caesarea to Carmel - where there is a Church honoring Elijah in Haifa at the Stella Maris Carmelite Monastery. 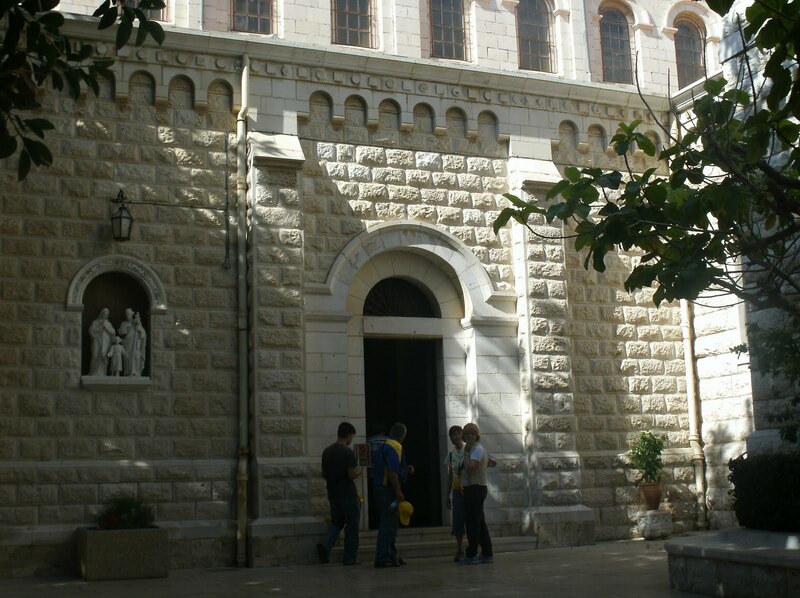 Although the monastery only dates from the 19th Century, Carmel has been considered a special place for meeting God even before prophets Elijah and Elisha lived there during their ministries. For more on this, check out: http://www.newadvent.org/cathen/03352a.htm. It is at Mt. Carmel where Elijah challenged and defeated the prophets of Ba'al as told in 1 Kings 18:20-46. 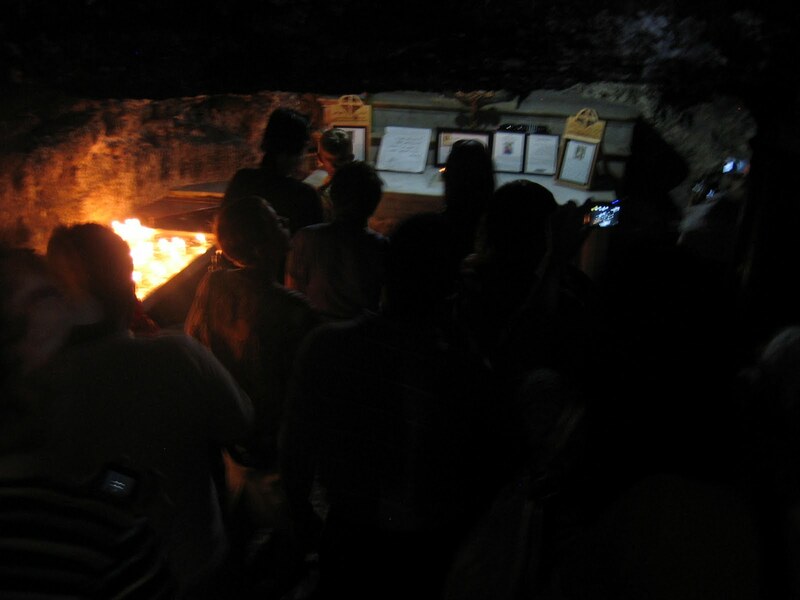 Inspired by Elijah's zeal and intimacy with the One true God, a group of crusaders and pilgrims became hermits on the mountain with the blessing of the Patriarch of Jerusalem. 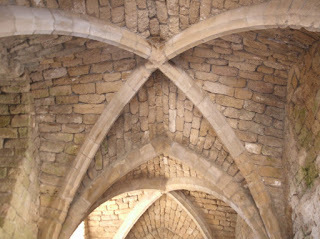 Each hermit lived in a grotto, similar to the one the Church is built over. These men eventually became known as the Carmelites, a religious community with a special gift for prayer, contemplative prayer in particular. They were driven out in 1291, but the community never forgot its connection with Carmel even as it spread through Italy, Spain, England and France. They came back to Carmel in the 19th Century. Because of their gift for prayer, the Virgin Mary has always been a special patronness of the community. Our Lady of Mt. Carmel is honored in the Stella Maris church. In fact, Stella Maris is an ancient title for Mary. It means "Star of the Sea." It is the experience of each of us individually but also of the Church historically that sometimes we struggle to follow the Lord. This is because the Lord tests our hearts to purify them so that we might see Him face to face. Mary was given the title Star of the Sea with the conviction that just as sailors look to the stars to find their way, Christians can look to Mary, her Scriptural example and maternal concern for each follower of her Son, to find the Lord. The monastary in fact looks out over the ocean on the side of Mt. Carmel. 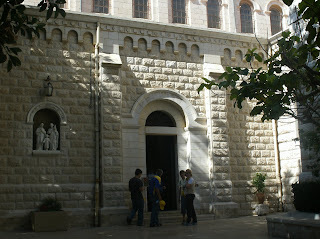 The Church itself is built over the grotto where Elijah is believed to have lived according to tradition. This gift of prayer is also related to Elijah. After confronting the prophets of Ba'al, Elijah despaired of his life. But the Lord nourished him and prepared him for a special encounter on another mountain, Mt. Horeb south of Israel. There, like Moses before him, he experiences a theophany, a manifestation of God's presence. Theophanies have a contemplative character, and this is especially true of Elijah's experience. This kind of prayer is at the heart of his prophetic mission. 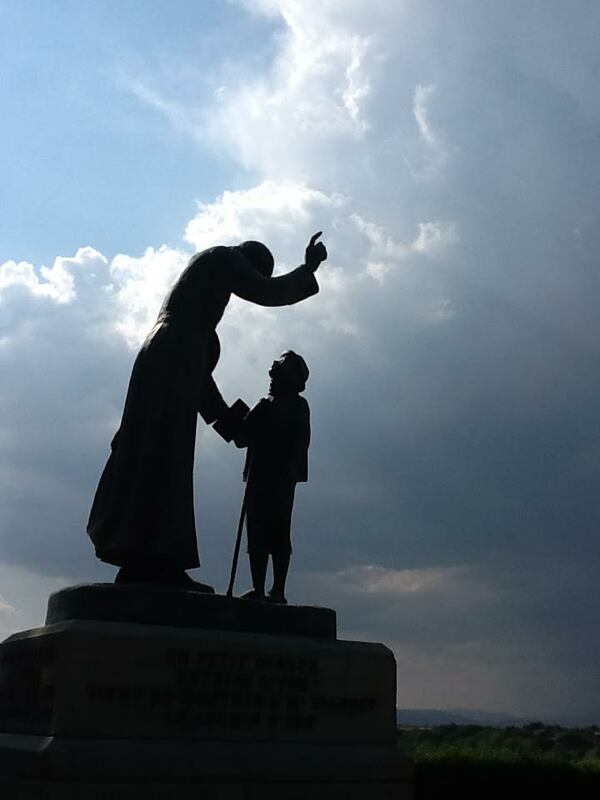 Carmelites seek a similar life of prayer. Contemplative prayer involves two essential moments - it is first of all a listening for the voice of the Lord, an attending to the slightest murmer of the Lord in our hearts. 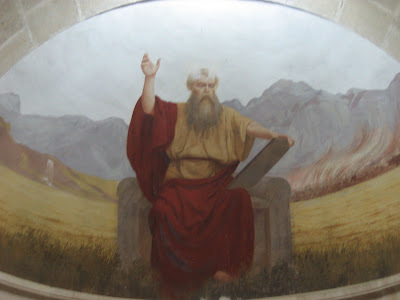 Moses and Elijah are connected to one another by this experience and their mission to Israel that flows from it - namely, to help Israel know the Lord. To achieve this kind of attentiveness to the Lord, a secondary moment is necessary, a moment of struggling for and suffering the truth. In this moment, every falsehood and fantasy must be put to death. It is a matter of on going repentance - that is thinking with the mind of God rather than clinging to a merely human perspective. Ba'alism represents a religion based in fantasy and convenient falsehoods. It provided a sort of social order by providing a kind of myth that helped everyone relate to one another. This kind of religion, however, is ultimately degrading. Human dignity requires the truth. Only the truth raises the dignity of the human person and makes it possible to hear the voice of God. In other words, to listen to the voice of the Lord requires a spiritual battle, a fight against evil that can be exhausting. But in this fight, if we are faithful to the end, the Lord provides us the nourishment we need and blesses us with a special gift of friendship with Him. We began our journey in Caesarea Maritime, on the coast of Israel. There we found the remains of the ancient Roman city built by Herod to honor Caesar Augustus and to establish his kingdom as a center for trade and entertainment. He built the port with both inner and outer harbors to attract trade and the shipping industry. His plan worked. The port became an important rest stop for ships voyaging back and forth from Alexandria and Asia Minor. 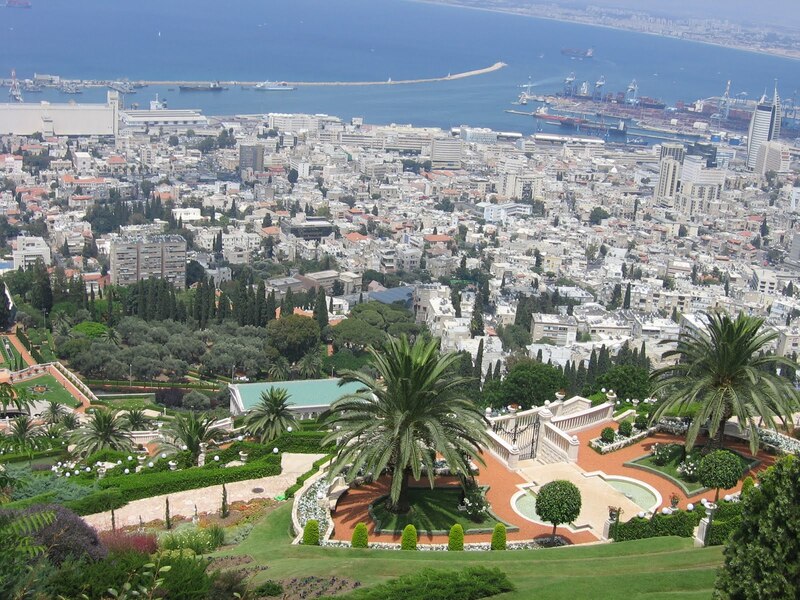 It was also the secular capital of Herod's kingdom. Jerusalem, where he built the Temple, was a much smaller religious center. The picture shows an entrance into the ancient theatre. 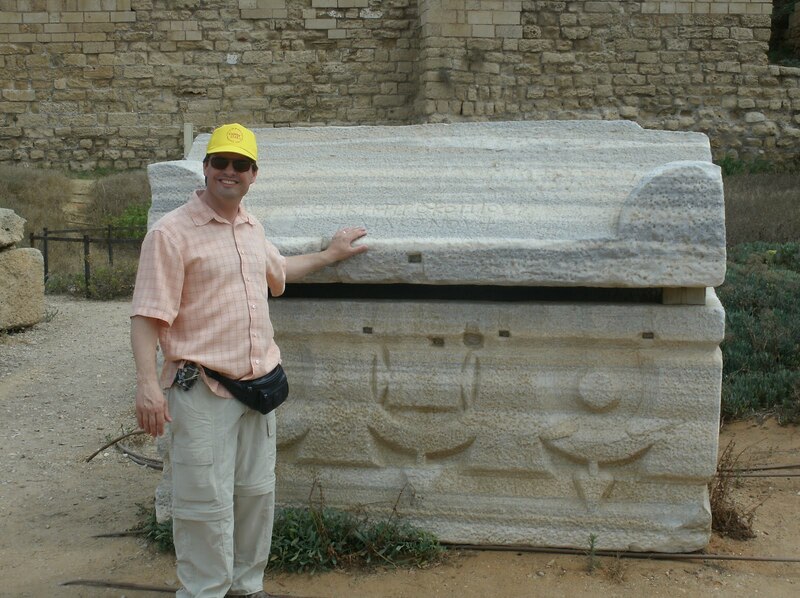 At the site, one finds sarcophaguses with ancient Christian symbols on them like the Alpha and Omega or the fish pattern. A living fish in Greek is Ichthus and each of the Greek letters of this word signify the heart of Christian belief - Jesus the Christ, the Son of God, the Savior. These are the vestiges of a once prestigious center for Christianity. 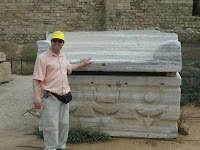 Philip and Paul preached here and, Peter baptized Cornelius, the first Gentile convert, and his whole household. Because of its connection with the apostles, and their missionary journeys, the Church in Caesarea was important in post-apostolic times, and a center of learning even while the Church was persecuted. Origen, a great patristic authority, founded a school of theology there and a priest, St. Pamphilus was martyred there in 309. One of the school's leaders and a student of Pamphilus was Eusebius of Caesarea In 313, Eusebius wrote the History of the Church, the first historical account of the Church since apostolic times. In the Byzantine period, the city had an octogonal Church built over the site of a pagan temple. 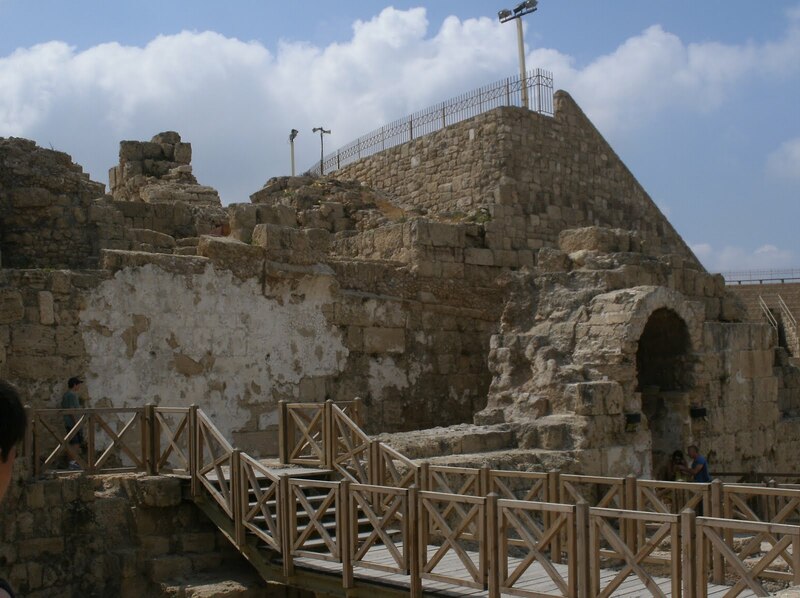 Christians were persecuted again in the 6th Century as the power of the Byzantine Empire began to decline in the area and in the first part of the 7th Century Caesarea was under Islamic control. 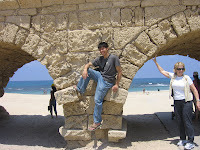 Caesarea was captured by the crusaders in 1101 and pillaged. It really was not until the French King St. Louis fled there in 1228 that it was rebuilt and fortified as a fully functional port city. Many of these 13th Century fortifications still stand. But in 1291, Muslim forces captured and completely destroyed the port. This city was really the first "See" of Peter and Paul, a sort of prototype for the Church of Rome. Although there is no functioning church to pray in, this was once a great place of Christian worship, life, architecture and culture. There is however the presence of the Lord in the ocean and in the architectural remnants of the Christian community that was there. As a pilgrim, I took some time to be mindful the Lord and to read the account of Paul's imprisonment in Acts where his preaching nearly convinces the Roman leaders to become Christian. As is normally the case when one reads the Bible in its geographic location, a sort of awareness of the concrete historicity of the mystery of our faith became overwhelming. It was as if I were hearing the preaching of Paul, as if I too were present to listen to his witness. This experience deepened my awareness of the Lord and what He has done for our sakes - and whenever someone recieves a grace like this, prayer flows like breathing. The fact is, apostolic preaching makes Christian prayer possible. Because there are preachers, we know to whom it is we call out to when we call out to the Lord.